Installed in applications where being able to see through the door is preferred. They offer light transparency, security, and a modern look. Give us a call to discuss the options that work best for you. 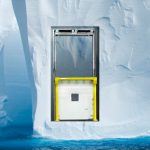 Our Retrofit Cold Storage doors come in manual or powered versions, Swing or Overhead type, provide state of the art insulating properties. Freezer models use heat cables between all outer edges and between sections to ensure smooth and consistent operation.